"Wait, remind me again why you didn't have a car in the first place?" As minimalists, we try our best to focus our possessions on what is necessary. We saw moving abroad as another opportunity to re-evaluate the state of our possessions and our lifestyle. We were confident that if we intentionally arranged our lifestyle and location in a very strategic way from the outset, a car would not be a necessity, but rather a convenience and a luxury. As minimalists, we also try to focus our possessions on what is most important to us. Cars are not important to us. Some people like cars. We don't particularly like them. We'd rather spend our money, time, and thought on other things. Case in point: we don't own a TV but we own a growing collection of instruments and a giant ping-pong/dining table. We weren't sure how our predicted budget would play out in our new, high-cost-of-living country, and eliminating car expenses would be one way to provide some financial wiggle room just in case. We wanted walking and fresh air to be a built-in part of our daily lives. We believe in sharing and borrowing and a spirit of communal living, wherein we all don't have to own one (or more) of everything but can share possessions amongst our friends. We hoped to depend on others for occasional rides, and have them depend on us for help in other ways. We wanted our kids to become good walkers, at ease using public transportation, aware of their surroundings--to become independent and city-savvy. We wanted them to experience both the the merits and pitfalls of carless living, and know that it can be done. We wanted to be resourceful by using public transpiration, as well as reduce our negative impact on the environment. We wanted to purposefully limit our activities to foster a simple, non-frenzied, anti-glorification-of-busy lifestyle. We wanted to purposefully limit our capacity to purchase more "stuff," partly by way of not being able to physically carry it! We figured there'd be no harm in giving it a whirl. We could always change our minds later. "So, what made you change your mind in the end?" 1. We became the music leaders at our church. This is no doubt the principle reason behind our decision. When we made our "Carless In Luxembourg" plan as we first contemplated a move abroad almost two years ago, we had no idea we would eventually be leading the music at our new church. When we took on leadership just over a year ago, we began rehearsing at our apartment every Saturday morning. Consequently, we began hauling instruments and other equipment back and forth between our place and the church on a regular basis. Our church rents a building on the other side of town every Sunday. We are not able to leave much equipment on site during the week, and we definitely don't have two of everything we need! 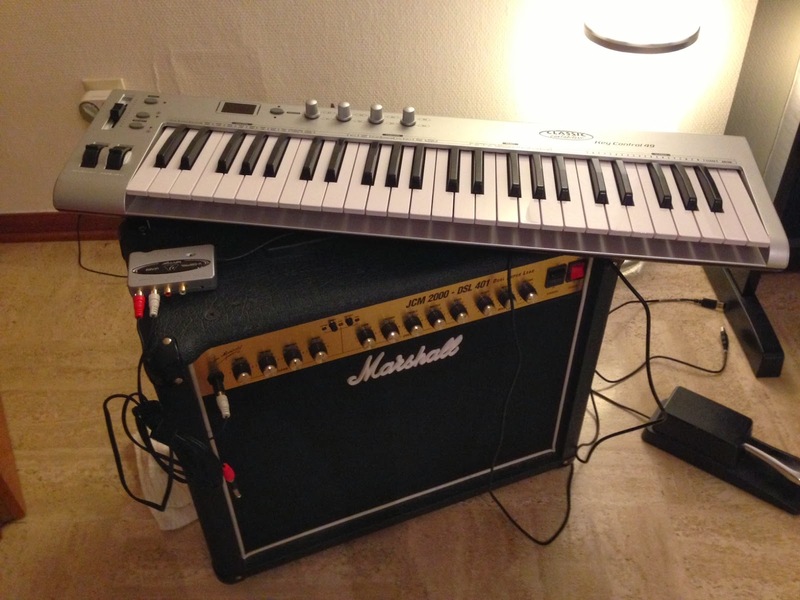 Sometimes we send some equipment along with the other members of the band after rehearsal, but inevitably there are a few things we have to take ourselves. 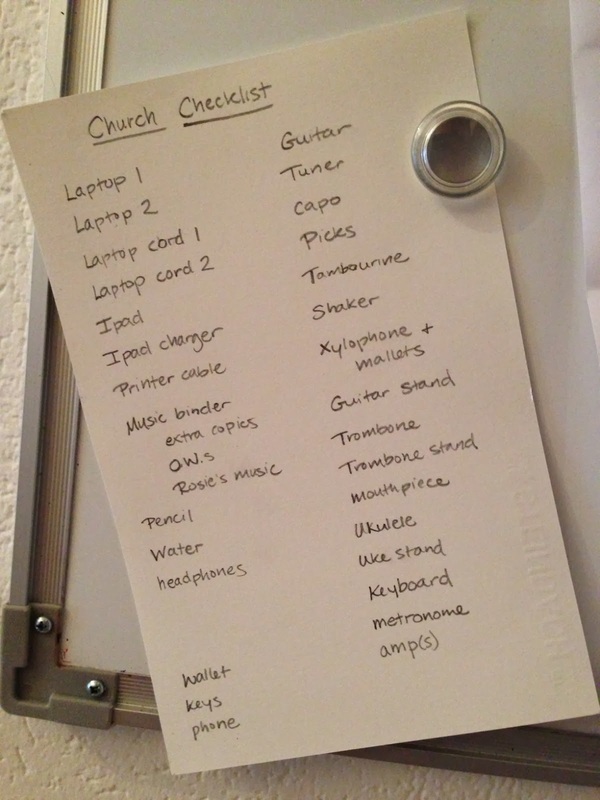 We started keeping this checklist by the door. We don't haul all these items every time, but there are always several from the list to bring. It's so easy to forget something (especially if you are Pete, but even if you're not!). And when you don't have a car, forgetting something is particularly painful! Then, on Sunday mornings, we need to arrive early to set up and practice. Unfortunately, buses are on a limited schedule on Sundays. This means Pete would take off on foot about two hours before start time, laden with equipment. I would follow a few minutes later with the kids and some smaller gear, walking/scootering rain-or-shine to the center of town, and then taking a bus from there to the church, arriving a few minutes after Pete. Sometimes, part of our family would squeeze into someone's car along with a few instruments for a much-appreciated ride home afterward. Gradually, the size of the band, number of instruments, and other associated equipment increased. We began rehearsing at church more often, which meant more trekking back and forth. We are always exhausted and drained after a Sunday service, and started seeking out rides home more often. Additionally, we began holding occasional rehearsals and auditions on weeknights. We just set up a rehearsal on short notice for tonight, and needed this equipment from church. Pete was able to dash out and grab it with the car last night instead of busing out there and lugging it back in the dark, cold rain. 2. The kids are becoming integrated here and are doing more. We are still living very simply and the kids are not even involved in any long-term extracurricular activities. But even the small amount they are doing, like attending birthday parties at far-flung locations, playdates, and the occasional creche vivante are becoming more common and more difficult to manage without a car. It's doable with taxis and lots of busing and walking, but yes, it's becoming more difficult. 3. Carless grocery shopping and other errands were still possible, but were getting pretty old. We developed some pretty good systems for managing on the bus, such as careful meal planning, weekend stock-up trips when Pete could carry the heavy non-perishables, and utilizing our small local market more often. But more and more, I looked around and found myself thinking that I don't want to and don't have to do this anymore. 4. We established that we could adjust our budget to make having a car possible without sacrificing too much on our other financial goals. We are confident after over a year and a half of living here that there is in fact room in our budget for car expenses. 5. It just felt like it was time. When you find yourself complaining more often than not. When your pastor starts giving all-calls at the end of church soliciting a ride for the Ts. When you realize you just spent your entire weekend busing and walking all over town. When you feel like you're not helping others enough to justify your own level of dependence. When you know you have plenty of money for a car. When even the strongest proponent of carless living in the family starts to give indication that it's time -- It probably just means it's time. "And what kind of car did you buy?" 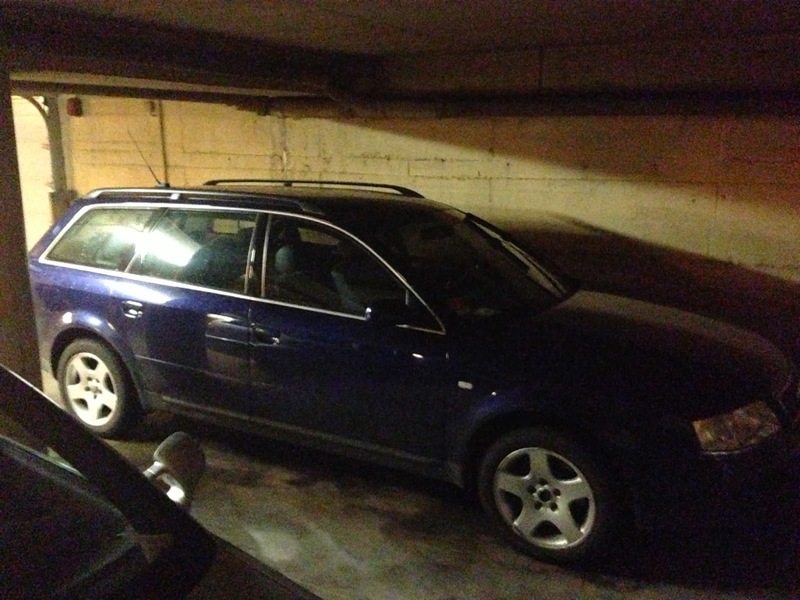 We purchased a 2000 Audi wagon through an acquaintance at church (I think there must be someone in every expat church who fills the niche of hooking up its congregants with cars). He already had the car on hand and it was within our desired budget and just what we had in mind. Although it's 14 years old, it's definitely the "nicest" car we've ever owned. We figured if we were going old and relatively inexpensive, we might as well go durable and reliable. Here, that equals German. Being a wagon, it's also big enough to haul all manner of instruments and gear. We spent 3950 Euros. "Are you happy with your decision? How does it feel?" We're both confident it was the right decision for us at this time. However, and surprisingly, I'm a lot more torn about it than Pete is. The first time I took it to the store, I felt very strange. It felt luxurious but in a spoiled sort of way. I felt like a big fat consumer, like I would buy all the things just because I could. I know I bought more than I usually do. I felt a bit dirty about that, to be honest. I feel like I can waste time at the store or just driving around. Yes, I felt free, but mostly free to be spoiled, privileged, and take it all for granted. When I park in the shared garage under our building (which is no small feat, by the way), I get out of the car and smell all the exhaust fumes that have built up in the air as I've carefully maneuvered myself into our impossible spot. I think about all the fumes I was not putting into the air previously. And then last week, under some duress from the fourth day of no hot water or heating due the building's boiler being replaced, we drove to McDonalds for dinner. On the other hand, I can also confidently sign up to bring a meal to a friend who just had a baby because I don't have to worry about how I'm going to bring it. I can immediately pop over to visit a friend who's had a horrible day. Pete helped some friends move last weekend. I can spend time writing a blog post today because we've consolidated our grocery trips from 3 to 2 per week. And get this: all four of us, plus all our gear, rode to church, and back, on Sunday, all together, all at the same time. That in itself feels like a miracle. When I announced our purchase on Facebook last week, with a bittersweet twinge in my heart, I wasn't sure how to interpret the "likes." Were they pleased that we finally caved? Did we join their team? Did they not know the backstory and just thought of it as a generally happy event? Were they sick of us talking about it? Did they think we finally came to our senses? Were they just tired of giving us rides?? Anyway, I have no idea how long these feelings will last. But we aim to keep walking a priority, minimize and consolidate car trips when possible, and do our best to appreciate our freedom, never taking our privileges for granted, always remembering what it was like. We'll also set some guidelines, like committing to always walk to and from school. This is coming from someone who, back in Oregon, was known to drive across the street to school to pick up her daughter from kindergarten when the weather was bad. But you know, I'd probably be driving the six blocks to pick up the kids from their school in Luxembourg too if we'd had a car from the start, and not even think twice about it. The no-car lifestyle has toughened me up too, for sure! We'll just see how we do. "How did the kids react to your decision?" When we first mentioned the possibility of buying a car to the kids, they weren't too excited. In fact, they voted to not get one. They both said they liked walking and taking the bus just fine. They worried about accessing their bikes and scooters with a car in the way (sometimes that's happened when we've borrowed or rented a car for a few days). Now that we have the car, the kids have told me they still feel like we are just borrowing it. Pete and I kind of feel that way too, actually. It's going to take awhile for it to register that the car is ours. I have a feeling the first time it needs repairs will do the trick. So that's the story. I'm curious as to people's reactions beyond the Facebook likes, though, if you'd care to share!